Today, 16 Feb 2018, is a Day of Prayer for Victims and Survivors of Sexual Abuse. The stone from the Liturgy of Repentance and Healing celebrated at the 2012 Eucharistic Congress has a permanent home on the lakeshore here at Lough Derg. It continues to challenge us all to play our part to create a church and a society where children and others who are vulnerable can be safe. Nearby stands Ken Thompson’s statue of Patrick the Pilgrim. Patrick, in his youth, was trafficked into slavery. He found the way to healing and new strength and became a blessing to the society that had enslaved him. 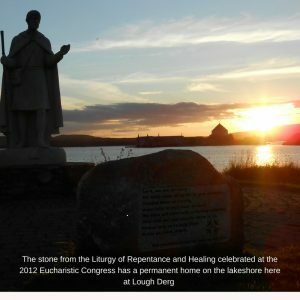 May Patrick inspire us to continue together on the long pilgrimage of repentance and on the journey towards healing, with the grace of the One whose power at work in us can do more than we can ask or even imagine. Fr La Flynn, Prior.